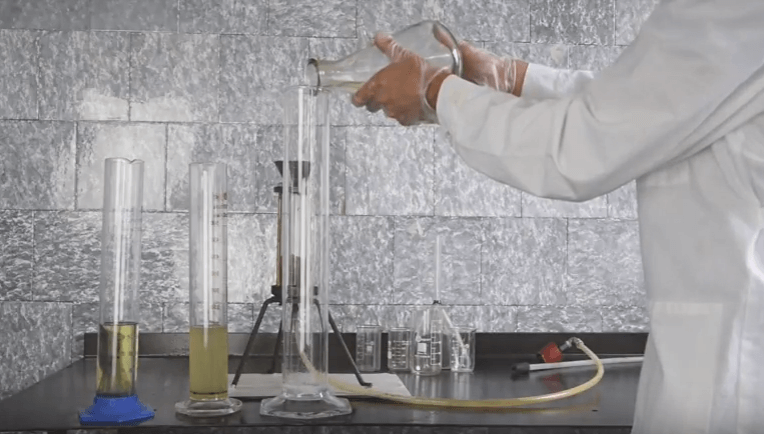 GlobeCore engineers have developed a new system for desulphurization of diesel fuel and here, we will show you - how to reduce the sulfur content in diesel fuel – using purification reagents. Flow chart of cleaning diesel fuel of sulfur consists of a tank with a volume of 1m3, a pump for pumping fuel from the tank into AVS-150 vortex-layer device with a measuring pump for supplying a reagent, a dispenser to supply the ferromagnetic particles into the working chamber of AVS 150 vortex-layer and UVR vacuum regeneration unit. We pour diesel fuel into the tank with a volume of 1m3. It is pumped into the working chamber of AVS 150, The reagent is fed at the same time from a 30lit barrel. The treatment in AVS lasts fractions of a second. Steel ferromagnetic particles help to mix the reagent with diesel fuel, The ferromagnetic particles wear of during the operation at 5g per 1 hour or 0,01gr per liter of diesel fuel. Then the solution is fed into UVR where it passes through the sorbent which purifies it from sulfur sediment. Ferromagnetic particles are reloaded automatically by a dispenser. The productivity of the unit is 0,5m3 / hour. The effectiveness of reagent cleaning depends on the intensity of mixing the components into an emulsion. Then the emulsion needs time to separate with precipitation of reagents. We use the vortex layer device AVS-150 to amplify the above mentioned process. It provides the intensive mixing of diesel fuel with reagent, despite high temperatures and low concentrations of solutions.
. Then the precipitation and filtration is done in the UVR- fuel, oil cleaning system. We will show you the sample after mixing it with reagent in our AVS-150 vortex-layer device, and then the sample after purification with sorbent on our UVR laboratory filtration unit.